Chinook Salmon is the top of food chain, is the largest of all Pacific Ocean Salmon, and is generally the most prized gamefish across the Great Lakes. We typically catch Chinook in the 10-25lb range over the course of the season with most Chinook being caught in June, July, and into August. When reaching about 10lbs and more, Chinooks are famous for their hard strikes and line screaming runs of 100 yards and more when hooked. The Chinook (and also the Coho) is the same kind of fish you see fishermen (and grizzly bears) catch in the rivers and inlets of Alaska and the Pacific Northwest. In fact our original stock of fish came from Oregon in the late-1960’s and they are the state fish of Oregon, Washington, and Alaska. 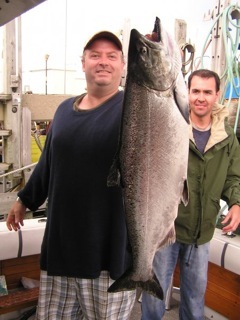 Our best fishing for Chinook usually occurs in June, July, and into August but we still catch some during the spring as well as into September. The Illinois State record for Chinook is 37lbs and was caught in these waters of Lake Michigan in August of 1976. 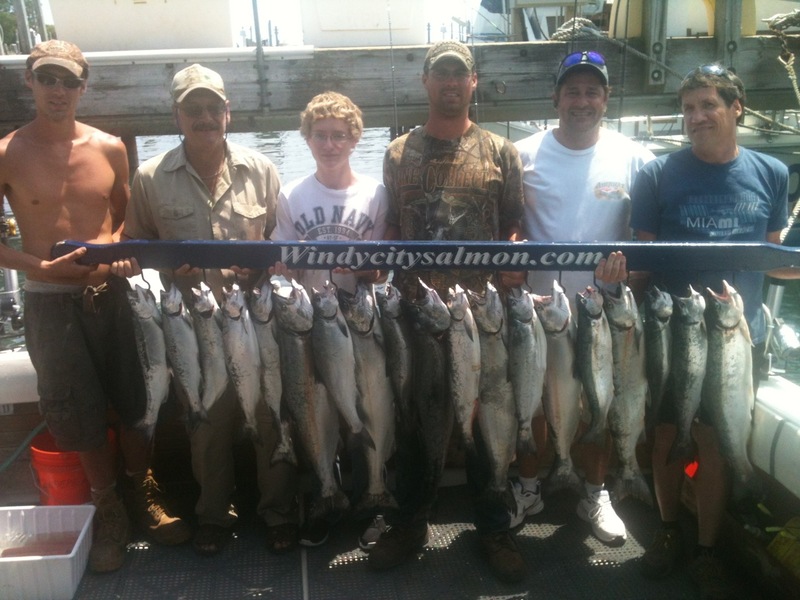 Windycitysalmon’s heaviest Chinook salmon tipped the scale at 25lbs and was caught during the 2013 season. Coho Salmon are the smaller but still very aggressive cousin of the Chinook, which we catch in huge numbers during April, May and June. We will catch Coho in the 3-6lb class in April and May and will often be tangling with larger Coho into June and July. While smaller than Chinook, Coho in the 6-7lb class and higher are very hard fighters and would easily give a Chinook of the same weight a run for its money. The Illinois State record Coho is nearly 21lbs and was caught in these waters of Lake Michigan in late May of 1972. 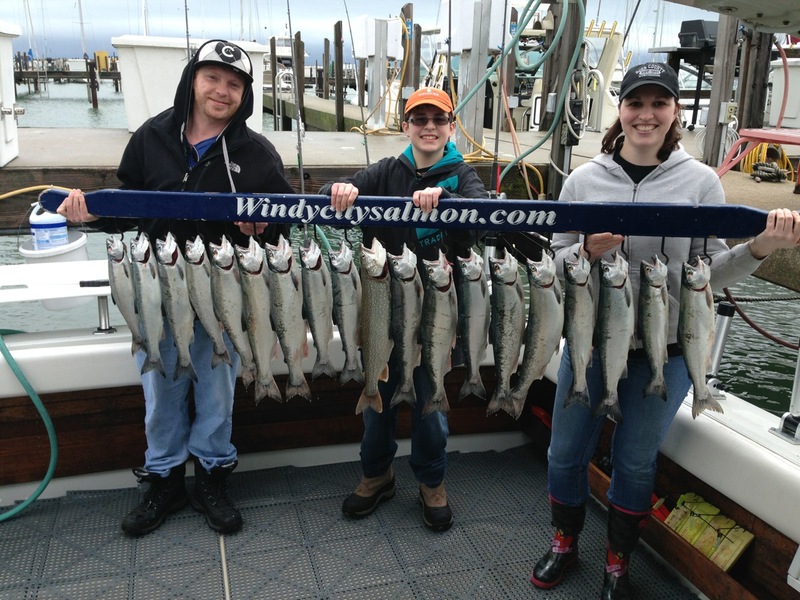 Windycitysalmon’s heaviest Coho weighed in at 15 1/2lbs and was caught during the 2015 season. The only real native gamefish to the Great Lakes, the Lake Trout has made a huge comeback after being nearly wiped out by the parasitic Lamprey Eel in the 1950’s and 1960’s and are again being caught in large numbers. Lake Trout are a unique fish and are native only to North America and nowhere else in the world. You would have to travel well into the Canadian wilderness to experience the same kind of trophy Lake Trout fishery we now have on Lake Michigan. We will experience world class Lake Trout action at the start of the season in April in both nearshore and offshore waters as well as from mid-August to the end of the season in late October. The size of our lake typically run on average from 8-20lbs. And of course it’s common to catch some over 20lbs as well. Illinois State record was caught in these waters of Lake Michigan in August of 1999 and weighing in at over 38lbs. Windycitysalmon’s heaviest Lake Trout weighed 32lbs and was caught on the last trip out in October during the 2013 season. In recent decades, the Steelhead fishery in Lake Michigan has taken off, offering anglers very aggressive strikes and many line peeling acrobatic jumps out of the water when hooked. Most of the Steelhead in Lake Michigan now are not the same species as those your father or grandfather may have caught. In those days, more colorful football-shaped Rainbows were caught and they didn’t jump as much. These were Rainbow Trout made to be Steelhead. These days we catch far more pure Steelhead strains of silvery, ocean run strains of fish with steel-blue backs that are generally longer and more narrow. These pure Steelhead strain-fish are also native to the Pacific Northwest and like the Salmon there, spend most of the life in the ocean but are born in freshwater rivers. We catch these hard fighting, acrobatic fish in the 8-16lb class throughout the season when schools arrive at the southern end of the Lake. On average though, we will catch more Steelhead during June, July, and August. The Illinois State record Steelhead was caught in these waters of Lake Michigan in early July 1993 and weighed more than 31lbs. Windycitysalmon’s heaviest Steelhead weighed in at 18lbs and was caught during the 2011 season. The variety of Brown Trout we fish for and catch is hard to beat anywhere in the world. Because of the forage base they feed on, Lake Michigan Brown Trout grow far heavier than their close cousins that fly fishermen fish for in the mountain streams out west but they are essentially the same fish. A very beautiful fish, our Browns take on a stocky physique and can be consistently caught in the 6-17lb range with heavier fish not at all uncommon. Usually inhabiting specific areas of shallower water, most Browns are are caught in April and sometimes October when we specifically fish for them. Browns fight very hard and like to stay down, right up until the very end. The Illinois State record Brown was caught in June of 1997 in these waters of Lake Michigan and weighed close to 37lbs. Lake Michigan was also home to two separate, 41lb 8 oz world record brown trout which shared that distinction from 2010 until a new world record of 42lb 1oz fish was caught in New Zealand in 2013. Windycitysalmon’s heaviest Brown Trout weighed in at 28lb 8oz, was caught during the 2010 season, and is now on his wall in his office.